Con­tin­u­ing my hol­i­day week­end of activ­i­ties, I went on anoth­er Atlas Obscu­ra tour to Flek­tro Stu­dios. Sandi was the offi­cial Field agent, but Erin was there, and our host was Michael Flecht­ner. 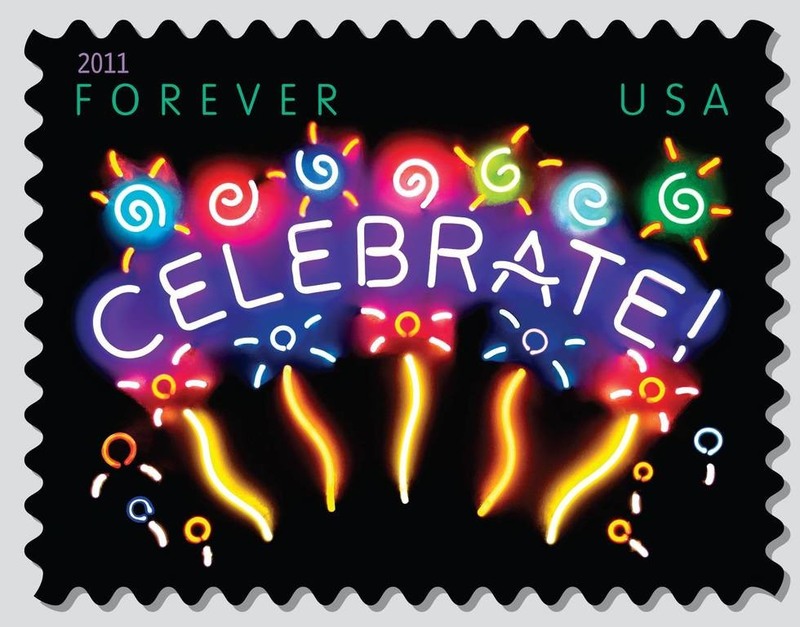 Among Michael’s many accom­plish­ments, he designed the “Cel­e­brate Neon” Forever stamp for the Unit­ed States Postal Ser­vice. 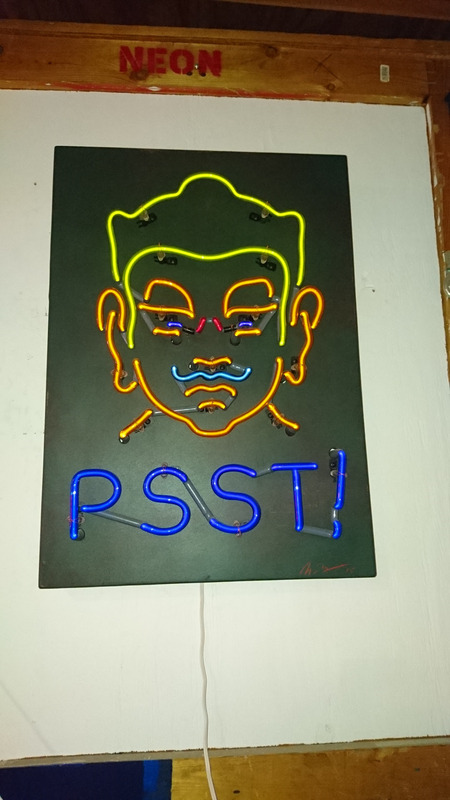 He is also on the board of trustees for the Muse­um of Neon Art and earned the J. Paul Get­ty Trust Fund Fel­low­ship for the Visu­al Arts. He is even one of the first Amer­i­cans to vis­it Cuba for the Havana Light project. 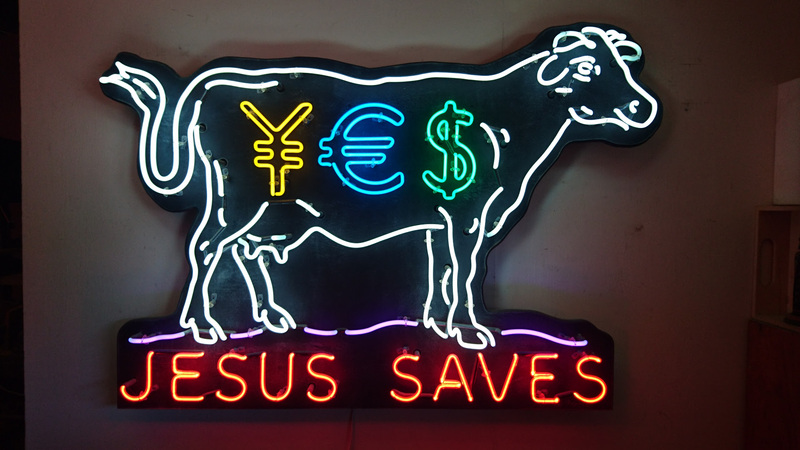 Michael is one of the few neon artists who cre­ates three-dimen­sion­al pieces. 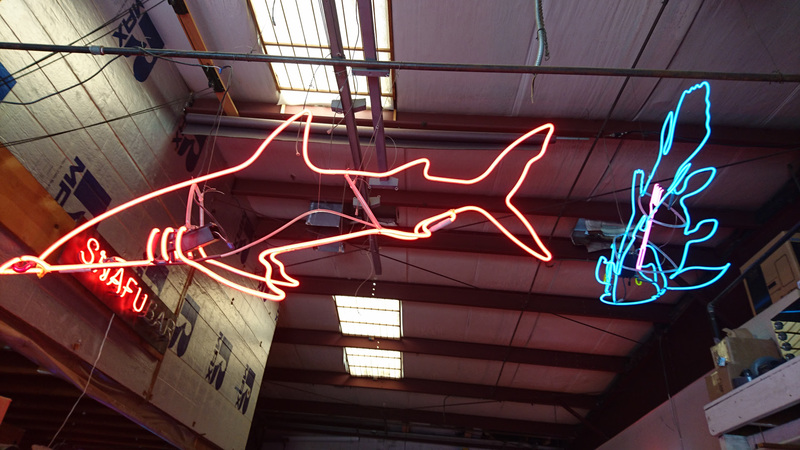 It is a bit hard to see from this angle, but the red­dish fish is a ham­mer­head shark. 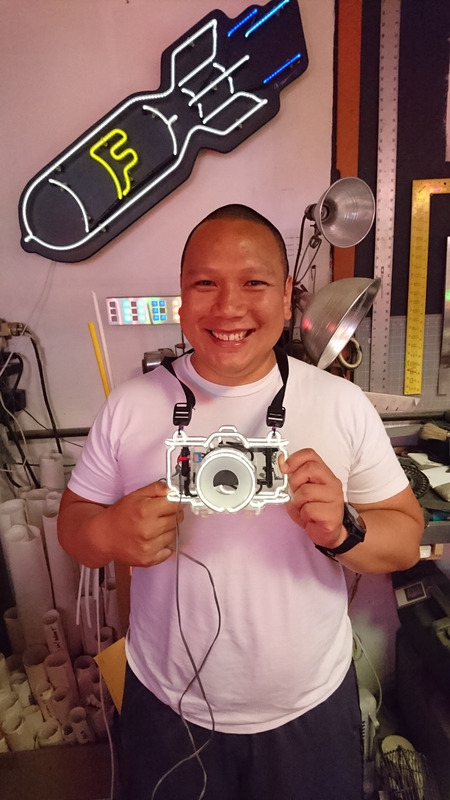 While we were there, he walked us through the entire process of mak­ing a neon light. In hon­or of Atlas Obscu­ra, Michael made a sim­ple AO. First, he start­ed with one long tube for the A, cut it down to size, and heat­ed up small sec­tions to get the tight bends. Then he got a sec­ond tube for the O and heat­ed up about half at a time to get the long curves. The tricky part was clos­ing the gap on the O with­out hav­ing the ends hit each oth­er. The last step of the shap­ing was to join the two let­ters togeth­er and close the out­side ends with elec­trodes. On one end, he put a small bulb in the glass to trap a tiny bit of mer­cury. 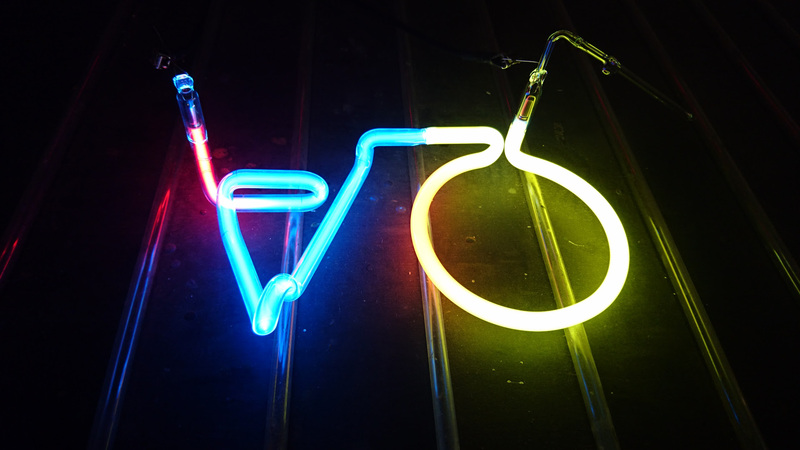 We learned that neon lights get their col­or in three ways. The first is the gas used — each of the noble gas­es can be used, and they each have a dif­fer­ent nat­u­ral col­or asso­ci­at­ed. The sec­ond is the glass tube — phos­pho­rus coat­ings on the inside of the tubes can con­vert the UV por­tion of the light emit­ted by the gas to a vis­i­ble wave­length. And the final method is mer­cury, which will turn any gas to blue when it is vapor­ized and sus­pend­ed in the gas. After fin­ish­ing at the bend­ing sta­tion, he took it over to the gas sta­tion. First he blasts extreme­ly high cur­rents through the tubes while they still have just nor­mal air. In the stu­dio, Michael actu­al­ly has a trans­former nor­mal­ly seen on pow­er lines for this pur­pose. 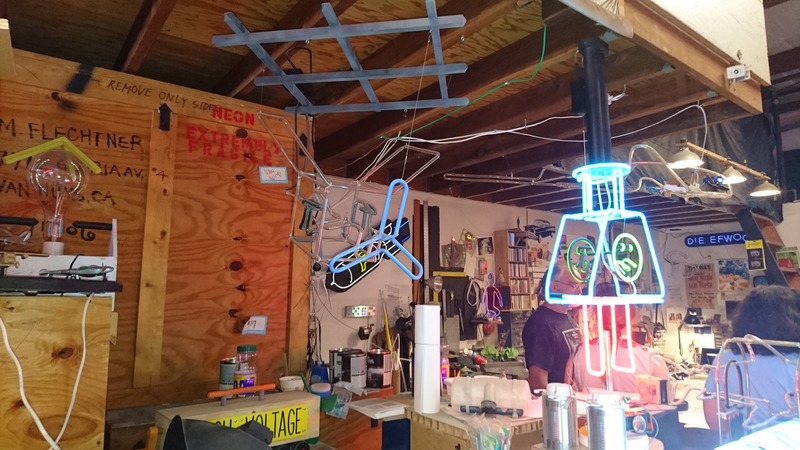 This burns up all the water vapor and oth­er impu­ri­ties in the tube, which leads to a longer life for the neon. 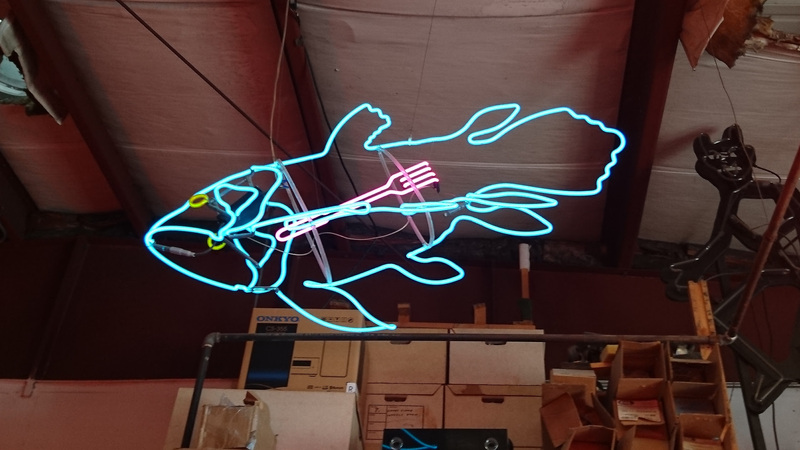 Michael told us about the neon signs at Clifton’s Cafe­te­ria, which have prob­a­bly been run­ning 24⁄7 for over 80 years with­out repair because they were well made. Then he fills it up with the gas of choice and runs “nor­mal” cur­rent through, and works the mer­cury from the trap through­out the tube. That is the stage we are in this pho­to. Once the mer­cury is even­ly spread, he gives it a few min­utes of steady pow­er to get an idea of what the final col­or will be. It took him about 45 min­utes to go from start to fin­ish. Michael tells us that mass-pro­duc­ers of signs, like for beer com­pa­nies to put in bars, are much faster than him because the shap­ing por­tion is stamped, not free­hand. Here are a cou­ple of videos of pieces I real­ly liked, for obvi­ous rea­sons. And my absolute favorite shot from the entire tour, me, hold­ing a neon cam­era and drop­ping an F-bomb. And as a bonus, here is a piece of Michael’s in the wild. Called “Yucky!”, it can be found at Sweet! Hol­ly­wood. 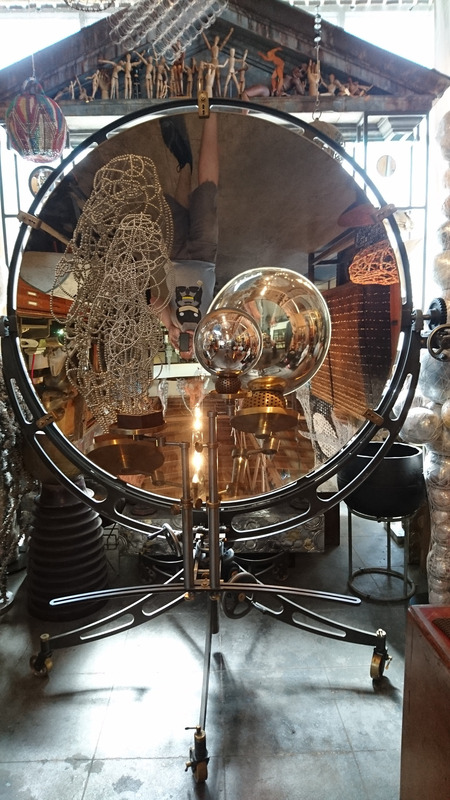 I went on an Atlas Obscu­ra excur­sion to MorY­ork, a warehouse/gallery/studio in High­land Park focus­ing on recy­cled art. Sandi was the offi­cial Field agent, but Erin was there, and our host was Clare Gra­ham. 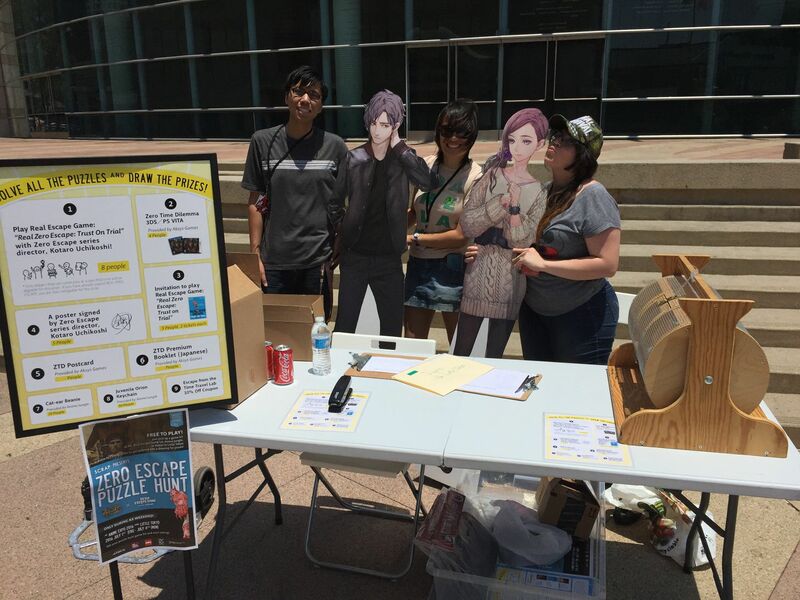 Once upon a time, Clare was the head of the Enter­tain­ment Art Depart­ment at Dis­ney­land. Now he is “retired” and can focus on his pas­sion, recy­cled art. He reli­gious­ly scours all the flea mar­kets, swap meets, and garage sales in SoCal to get mate­ri­als such as but­tons, bot­tle­caps, and Scrab­ble tiles to build sculp­tures and fur­ni­ture. He told us about how it all start­ed. He was the youngest of many, and had lit­tle to call his own. His most prized child­hood pos­ses­sion was a roller desk where he could safe­ly keep any odd­i­ties that he found and tin­ker with them. Skip for­ward a few years, and Clare spent “too long” in school, get­ting every art degree known to man. He said that a big part of the rea­son he was in school for so long was access — to ideas, but also mate­ri­als and work­spaces. While work­ing at Dis­ney, he would still tin­ker with found art, but only in the very lit­tle free time he had. Now that he is retired, he enjoys being able to do only what he wants, at any time he wants. (Which is why he does not do com­mis­sioned work.) He has much more time to go find odd­i­ties, and now his roller desk is a whole build­ing. 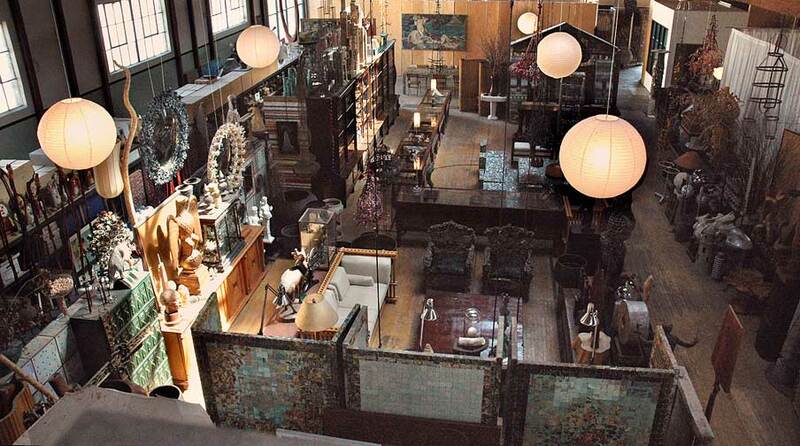 The space is very inter­est­ing, it was a gro­cery store and a roller rink pre­vi­ous­ly. It has wood floors and a nice high ceil­ing giv­ing Clare lots of space to store his mate­ri­als, com­plet­ed pieces, and dis­play cas­es of items he found and kept as-is. 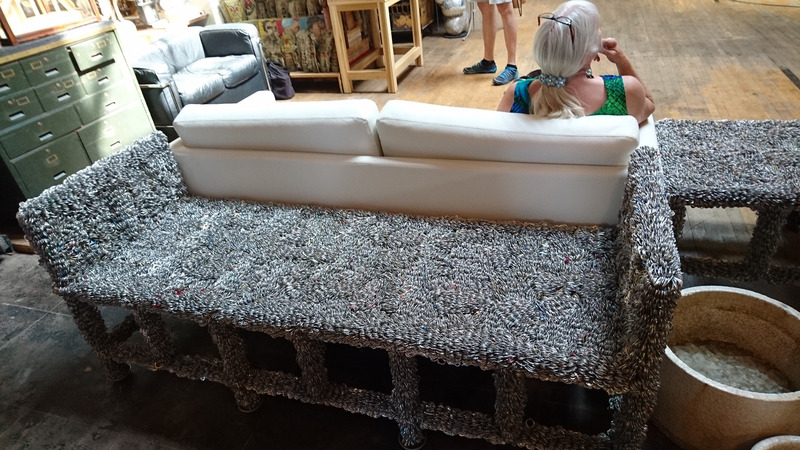 One of the first things you notice when you walk in, this is a couch made from pop-tabs from alu­minum cans. Clare also made a side table and a chair in the same style. The basic frame is made with rebar, then he laid chick­en wire over it. The final look is accom­plished by string­ing the pop-tabs on wire and wrap­ping the wire around the chick­en wire until it is packed solid. 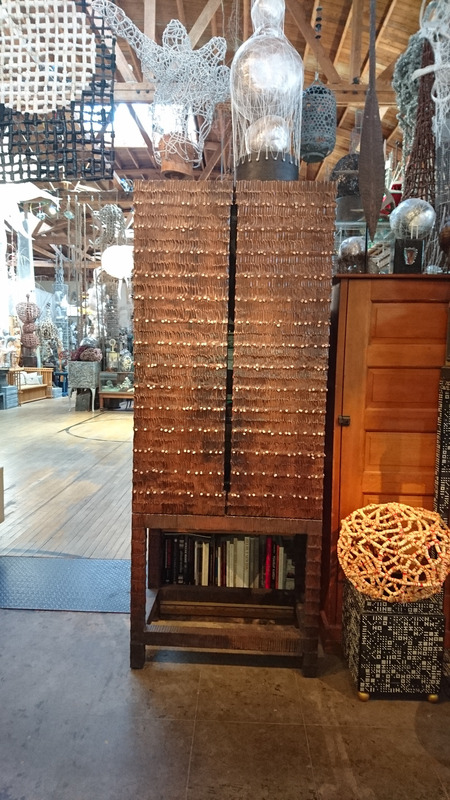 This is a 60″ con­cave mir­ror made by Bausch & Lomb for the US Army dur­ing the Viet­nam War. There was a set of three made, and they were mount­ed on vehi­cles dri­ven out into the jun­gle and point­ed into the sky. Record­ing the light in the night sky off the mir­rors allowed the Army to tri­an­gu­late the flight paths of North Viet­name­se bombers back to their hid­den airstrips. When Clare got it, he cus­tom designed the mount you see in the pic­ture so it can be cranked along two axes into any ori­en­ta­tion. It is hard to see from this angle, but there is an arm extend from the base to the front cen­ter of the mir­ror where a crys­tal ball is mount­ed. 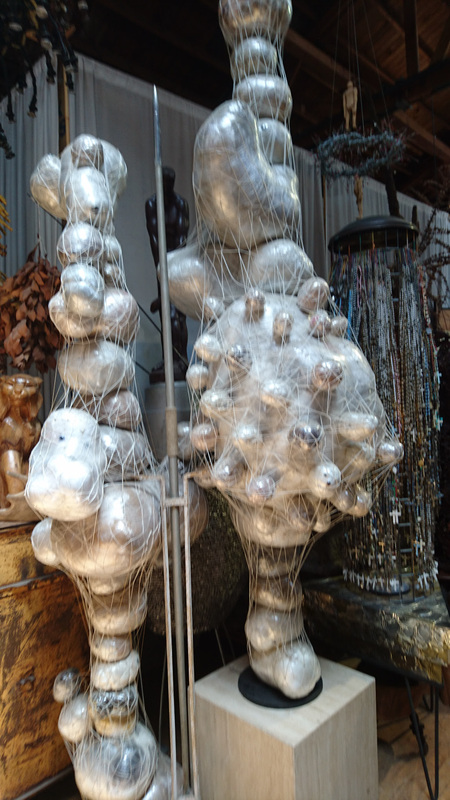 The­se two sculp­tures in the fore­ground con­sist of orbs made of stuffed ani­mals tight­ly wrapped by plas­tic wrap and then held togeth­er by twine net­ting. Per­haps the odd­est of all, this is a cab­i­net lined with human teeth. Inside are var­i­ous arti­facts of health and fer­til­i­ty. Clare’s sto­ry about get­ting the teeth was very weird. In Amer­i­ca, extract­ed teeth are con­sid­ered human waste and dis­pos­al by den­tists is mon­i­tored. Amer­i­can cre­ma­to­ries burn too hot and bones and teeth are destroyed, but even if they were not, they would still be human remains and mon­i­tored. In India, cre­ma­to­ries do not burn as hot and the teeth remain. How­ev­er, import­ing human remains is again tight­ly con­trolled. 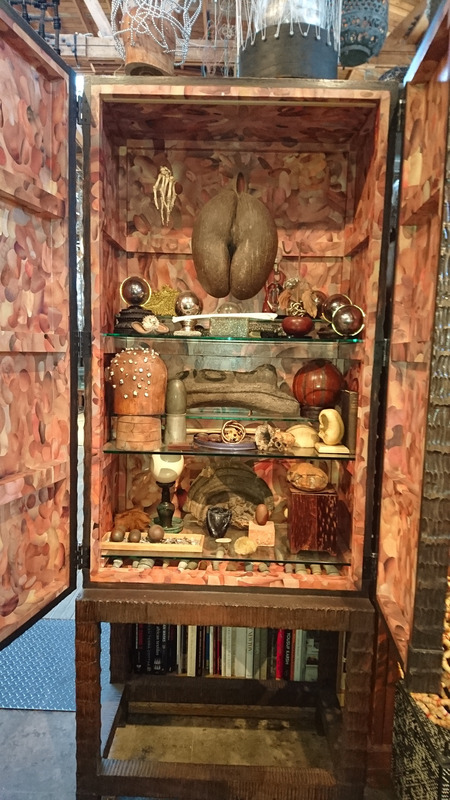 So there are busi­ness­es that take human bones and teeth and make “art” with them. The art pieces can be import­ed freely. When you receive your art, there is a small instruc­tion card telling you to break up the piece and boil it in water, which melts the oth­er art sup­plies away from the bones and teeth. Good to know, in case I want to fake my own death or some­thing! 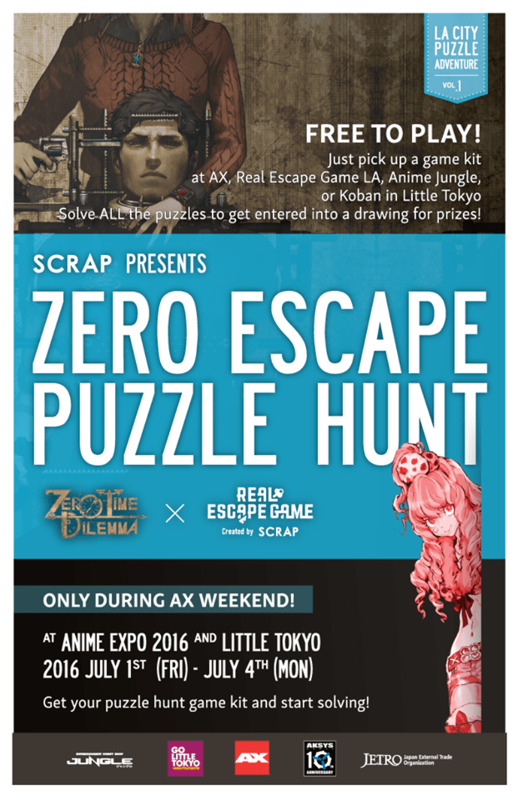 If you get a chance, you should take a look at this place. I have bare­ly scratched the sur­face of all the weird and won­der­ful recy­cled art Clare has on dis­play. Walk-ins are wel­come when­ev­er the front door is open, and they have reg­u­lar neigh­bor­hood events such as live music.